Partners in the “Embodied reMOte Tower” or MOTO project are using various sensory techniques to introduce auditory and vibro-tactile stimuli into the remote towered environment. Airports are important nodes in the European ATM system and therefore critical to increasing performance. It is for this reason that many of the SESAR exploratory research projects are addressing aspects of airport operations, from improving information exchange and decision-making, to enhancing air traffic control and meteorological forecasting. Blending academic and industrial know-how from across Europe, the projects aim to take a fresh look at challenges facing ATM and airports, relying on advances in technologies such as augmented and virtual reality, data analytics, automation techniques, economic assessments of changing business models, as well as exploring other disciplines for inspiration. Controllers in airport towers rely on being able to see aircraft taxiing, taking off and landing in order to manage them safely and efficiently. But when bad weather sets in, their visual situational awareness can be impaired, leading to a reduction in throughput. 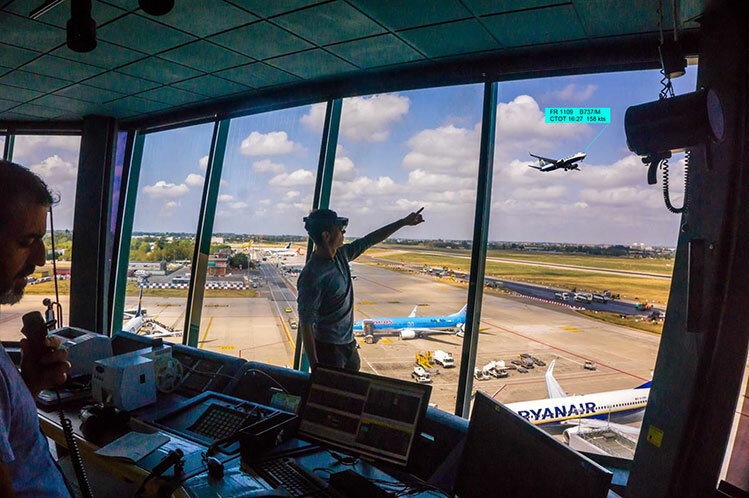 The results from the “Resilient Synthetic Vision for Advanced Control Tower Air Navigation Service Provision” or RETINA project are showing the promise that augmented reality holds for enhancing air traffic control operations, particularly in low-visibility conditions. Using synthetic vision and augmented reality technologies, RETINA has developed a set of goggles through which controllers can see synthetic information overlaid on the actual “out-of-the-window” view. With these goggles, the controller can have a heads-up view of the airport traffic, call sign and aircraft type, supplemented by additional information, such as wind velocity and direction, airport layout and runway status, even during low-visibility procedures. Europe is seeing a growth in the number of remote control tower deployment projects in recent years. With advances in camera, sensor and infrared technology, controllers are given a realistic “out-of-the-window” view of the remotely-located airport allowing remote provision of all tower services. 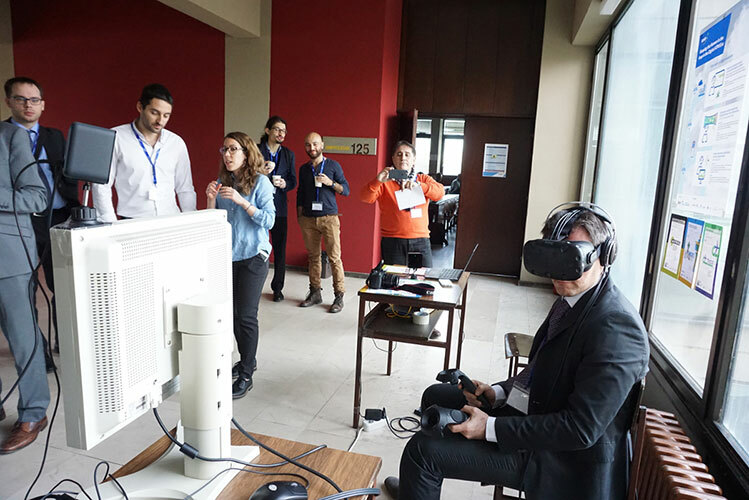 SESAR researchers are now investigating how to make this virtual experience even more immersive by exploiting controllers’ senses in addition to their visual sight. Partners in the “Embodied reMOte Tower” or MOTO project are using various sensory techniques to introduce auditory and vibro-tactile stimuli into the remote towered environment. Partners are measuring the impact of these stimuli on air traffic controllers, in terms of situational awareness, a sense of presence and performance. The aim then is to develop augmented reality solutions that incorporate these stimuli to help controllers become fully immersed in the remote tower environment, enhancing their ability to manage traffic safely and efficiently. Airports are complex places, especially when it comes to managing the movements of aircraft and a myriad of service vehicles. It is not surprising then that SESAR members and partners have invested significant effort to research, develop and deliver a first set of automated tools to support controllers in managing airport surface movements. Now partners in the “Take Control” or TaCo project are taking a fresh look at the challenge of complex surface operations especially in non-nominal conditions by exploring automation in other disciplines, such as robotics and gaming. Like air traffic control tools, video games such as real-time strategy games, use highly interactive graphics to enable gamers to manage the course of the game. With these insights, TaCo partners have developed a prototype with highly automated functions for guiding the controllers towards an optimised management of the movements of airport vehicles and aircraft: for example, it supports them in maximising the usage of the runway, minimising the global fuel consumption, or supervising the system. Moreover, it allows controllers to define the behaviour of specific parts of the airport through innovative user-programming techniques. Big data is becoming a big deal for airports, as it is increasingly used to better analyse market demand, optimise security control and customise the passenger experience. The use of big data analytics is now being put to work to better understand how passenger behaviour can impact air traffic management. Research in these areas has so far been constrained by the limited availability of behavioural data, typically obtained from static demographic and economic datasets, often consisting of very small samples, and usually complemented with assumptions about behaviour. Thanks to the growth of smart devices and interconnected services, researchers now have large-scale, detailed longitudinal (dynamic) data allowing them to test hypotheses about passenger behaviour. Partners from the BigData4ATM project are investigating how different passenger-centric geo-located data can be analysed and combined with more traditional demographic, economic and air transport data to identify patterns in passenger behaviour, door-to-door travel times, and choices of travel mode. The project is also exploring applications of this data and how it could be used to inform ATM decision-making processes. The results from the “Resilient Synthetic Vision for Advanced Control Tower Air Navigation Service Provision” or RETINA project are showing the promise that augmented reality holds for enhancing air traffic control operations, particularly in low-visibility conditions. Europe is a patchwork of markets in ATM service provision. The question is, which market structure is most favourable to increasing the performance of ATM, including at airports? The answer is a complex one that partners in the “Competition for Air Traffic Management” or COMPAIR project are seeking to address. Partners in the project looked at a number of options that could increase competition, including performance regulation with variations in ownership and governance models, tender of licenses for en-route air traffic services, and flight-centric, sector-less operations. The project also analysed the effects of unbundling the terminal control in Sweden, UK, Spain and Germany (at mostly regional airports). The models applied by the project suggest that introducing competition in the market via outsourcing service provision may lead to a reduction in charges by up to half the current levels. It also showed that open tendering is likely to lead to a defragmentation of the system as companies tend to win more than one tender. The results suggest that with these options a maximum market share of 40% can ensure sufficient competition. The final conclusion of the project is that competition of this nature will determine the uptake of new technologies and enable a high performing ATM system. Adverse weather conditions can play havoc with airport operations, limiting or putting a stop to aircraft movements, runway maintenance, de-icing, tower control and even luggage handling. Having accurate meteorological data and forecasts means that airport operators can prepare for the worst in advance. But weather can change in a matter of hours. That’s why partners in the “Probabilistic Nowcasting of Winter Weather for Airports” or PNOWWA project are turning to nowcasting, very short-term (0-3h) probabilistic winter weather forecasts with a 15-minute-time resolution. Focusing on snow, the partners extrapolated weather movements based on radar echoes and predictability of changes in snowfall intensity caused by underlying terrain (such as mountains and seas). Within these nowcasts, the projects provided information on the probability of a wide range of events, such as runways freezing over or decreased visibility. Over the course of the winter of 2017, the project partners demonstrated their model in Austria and Finland, allowing them to gather airport feedback on the applicability of the model and its scalability to other airports. The SESAR exploratory research projects are funded within the framework of the EU’s Horizon 2020 research and innovation programme.